It was critical in such a competitive market to get the branding right for a new product from day one. 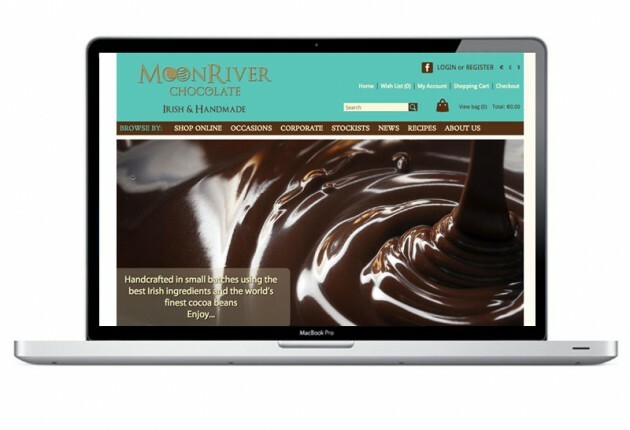 The first part of this process was to design the new corporate identity for MoonRiver Chocolate. Click here to read more detail about the branding process. 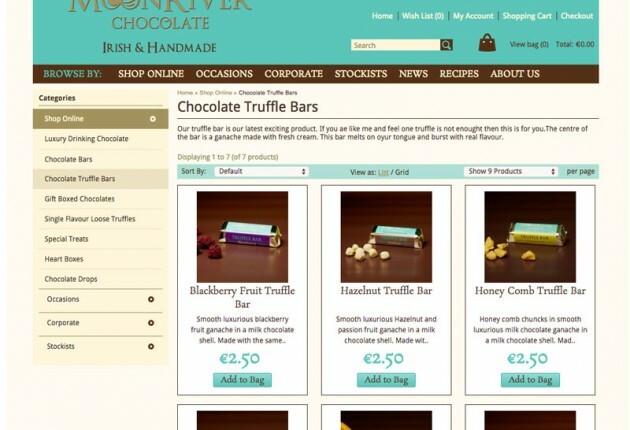 Following completion of the branding, we started into the new eCommerce website process. 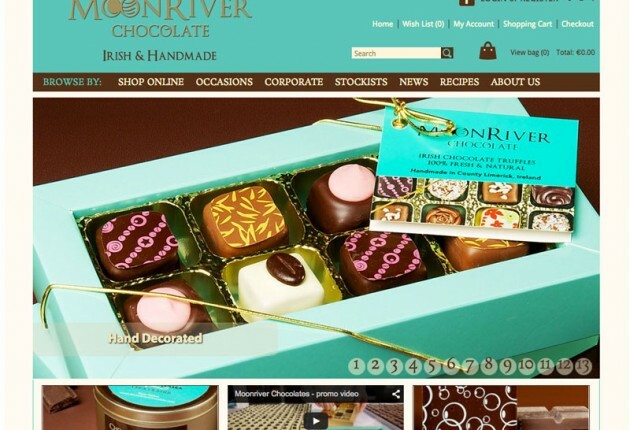 Log onto www.moonriverchocolate.ie to view the site. For Louise’s website, it was of course critical that the branding and corporate colours are consistent throughout this eCommerce website. The navigation is clear and easy. Following brainstorming and research of competitors internationally, we started working on the website wireframe and agreed on the required navigation. The site incorporates all functionality that you would expect from an eCommerce site. It processes orders easily and you receive your delivery directly from Louise. The user can also purchase a gift voucher from the site. The banner header is made up primarily of the corporate identity and call to actions focusing 100% on the shopping cart. The main navigation then focuses on the Browse by options which allow the user to browse by Product Range, Occasion and Corporate. This navigation bar also contains general links for About Us and News. The sliding banner is a very important feature on the site and is purposely large in size. It enables the display of the amazing product range that Louise has designed. It is so important to get the photography right for products and so we have worked with Paul Dorrell Photographer who has been fantastic in achieving superb images, really capturing these individual chocolates and products. Louise and Paul worked closely to achieve the end result and the work paid off. The sliding banner is very easy for Louise to edit, which is a regular requirement as she quickly creates tasty new products. Check out the video on the home page as well that tells Louise’s story. Louise is continuously designing new products and the MoonRiver Chocolate brand is expanding all the time so watch this space.